Cakes may need twice as long in the oven as the book says, or even longer. Apart from that, the recipes are uncomplicated and tasty. A quick and easy lunch which feels quite substantial as it uses chickpeas. The tomatoes cook quickly so it feels as though you have made much more effort than you actually have! A lovely salad and easy to make. Strong flavors. Me and the children loved it, husband just liked it well enough. Super-easy soup that is great if you have a lot of zucchini to move! OMG - if you don't fall in love with this supper there is no hope! Not bad, and very quick to do. I liked this, but my 7 year old daughter hated it, so I am going to wait a year or so to make it again. It needed 10 mins longer in the oven than the recipe said, even though I had halved the recipe. Nice, but not that special. I think I somehow missed the point of this recipe. The sage didn't stick too the birds at all, and I think I cooked them too long (how long is "almost overcooked" anyway?). A second batch that I cooked for a bit shorter time was better, but still unspectacular. This looked spectacular, just like the picture in the book. It smelled very nice as well. However, the pumpkin didn't get really soft even after an hour in the oven, and after that it was a bit dry - I don't know if it was overcooked, undercooked or something else. Lovely. Robust flavors, subtly different from other recipes I have for cauliflower. Easy to make and forgiving of changes in the ingredients. Will definitely make this again. Very good, a nice balance of flavors, and flourless (and therefore glutenfree) too. Not difficult, but quite elaborate. I found it almost impossible to dissolve that much instant coffee in that little water, it all became a large lump. Next time I will simply sprinkle it into the mixture. The oven time it needed was almost double the time given. Knowing that people lead busy and demanding lives, Rose Gray and Ruth Rogers have made their innovative recipes even more accessible to those who love good food but have little time to prepare it. Recognising that the key to quick cooking is often in the ease of buying the ingredients, the recipes highlight the fresh produce you will need to shop for as well as the ingredients that are store cupboard essentials. 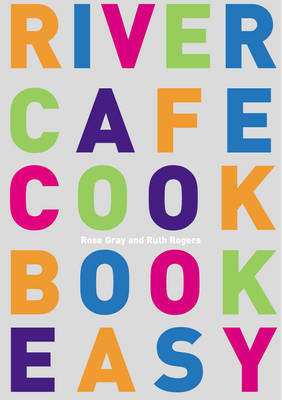 Ruth and Rose then take you through simplified steps to cook great dishes that are bursting with flavour and style. To complement this new concept, the book has a fresh, dynamic design and superb photographs that will delight both new and established fans. Like River Cafe 'graduates' - most famously Jamie Oliver - you can learn the secrets of cooking fabulous food, but now it's even easier.